The only Rack Extension supported by default on all the "factory" provided Remote Codecs+Maps is Propellerhead's own Radical Piano. Yup... so now what ? 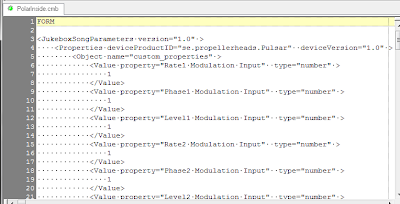 Here's some tricks for every Remote Dev/"hacker"/enthusiast and/or power user that knows how to or likes to keep their own customized versions of their controller Remote Codecs and Maps. Q1: What's the quickest way to list all the Rack Extension Remoteables ? 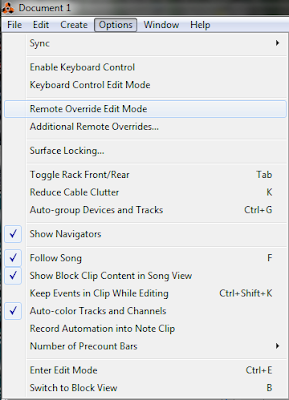 A1: Besides the traditional and tedious way of engaging the Options, Remote Override Edit Mode, and going through each of the device controls, hovering the mouse over them and taking notes of its Remote designation, there's a quicker and easier way to do this for the Rack Extensions. As you may already know, there's a new patch file format introduced with the Rack Extensions known as RePatch (extension .repatch). Great uh? Yup, it's awesome! This new format allows many patch generating/editing tricks (maybe I'll post about it in the future) but, the first thing you'll get out of this is easy access to the internal names of each control (knob/fader/button/...) of the Rack Extension that saved that .repatch file. "What about all the other Rack Extensions that don't have Patch saving capabilities ?" Ok, let's see an example, shall we? 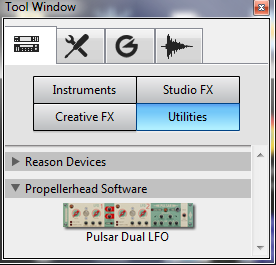 Let's say I want to add support to Pulsar on my custom version of the M-Audio Axiom 61 Remote Map. 5) Start your preferred text Editor and open that same " PulsarInside.cmb" file with it. Note that, sometimes, you may need to replace any "_" char for a white space " ", so if there's an internal parameter name like "EG_ATTACK", as a remoteable it might become "EG ATTACK", being the one you want to use inside your .remotemap file! Also, because internal parameter names used in patches aren't exactly the names declared as remoteables, you should expect some kind of trial'n'error with this, also because not every saved parameter is supposed to be exposed as a remoteable, so... don't be surprised if some of these simply don't work, ok? :) ...this is just a "brute force" way to quickly get everything. 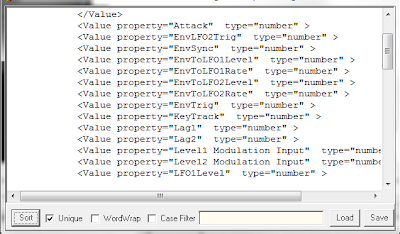 For instance, that raw list will need some adjustments, when you compare it with what you'll get when doing a check of each Remote Override naming. Q2: What about the Scope line ? How do I identify the Rack Extension as a Scope? A2: Well, there are 2 things you'll need to know to make the Scope line: The device ID and... the CompanyID that made it. 1) To get the Rack Extension ID, you'll need to check the folder where the Rack Extensions are kept (saved/installed). I don't own a Mac (sorry!) so I'll give you the Windows path (and maybe someone in the comments can add the OS X equivalent). So, navigate your Windows explorer to the path "%AppData%\Propellerhead Software\RackExtensions" and you'll see a list of folders per installed Rack Extension. 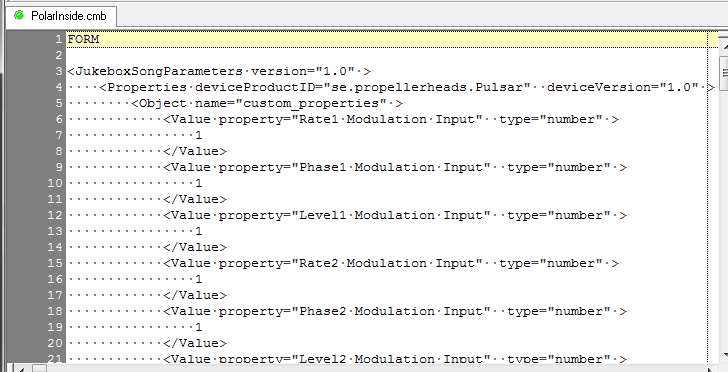 Continuing with the Pulsar example, you can easily spot a folder named "se.propellerheads.Pulsar.1.0.0" right? Excellent work Kosh! Very informative. This was incredibly useful and helpful. Just brought new life to my Edirol PCR-300 controller. 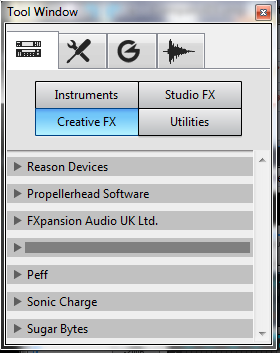 Having used previous versions of Reason prior to recently getting 6.5, Remote mapping just worked. I wasn't really sure what was going on under the hood, and was a bit perplexed why my controller wasn't able to work with Remote with the new Rack Extensions. Might be something Propellerheads may want to clear up. In any case, I am so happy that these preference files are accessible and editable. Thanks for sharing this information, should make many Reason owners more productive! If you're unable to save the .remotemap file, then you'll need to check your file system permissions or if those files are set as read-only. If you're able to save the file it looses your changes each time you run Reason, then you should try increasing the Map Version number in that file so Reason sees it as a newer version than the factory provided one. I have no idea how it works with the Macki Control Universal. How to set up these controls to a mackie controle? I was trying it with your method but it doesnt wotk well for me!